Old Cheung was sitting on his front porch when he noticed his house was on fire. He ran inside to retrieve his children who were asleep on the second floor. Moments later, Cheung re-emerged with two of his three sons. “What happened to little Mickey?” asked the neighbors. “There wasn’t enough time for the third,” said Cheung. But there clearly was – the fire started in the basement and hadn’t yet spread to the rest of the house. “Go back in to get Mickey, old Cheung,” the neighbors urged. An intense discussion among the neighbors ensued, as the crowd debated Cheung’s assessment of his youngest child. While many found Mickey energetic and intelligent, others concurred with Cheung that the boy didn’t quite measure up to his brothers. If you find my story far-fetched, then you mustn’t have been paying attention to C.Y. Leung’s latest political crisis. Two weeks ago, his cabinet approved two of the three applications for a free-to-air (FTA) television license. 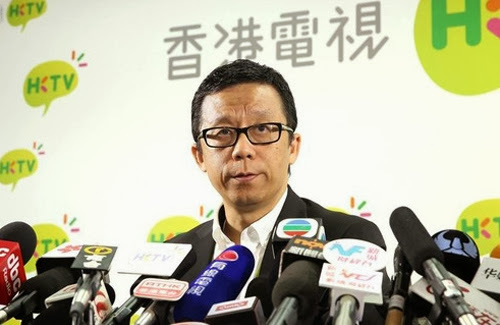 The sole rejection went to Ricky Wong’s (王維基) HKTV, the bid most favored by the public. 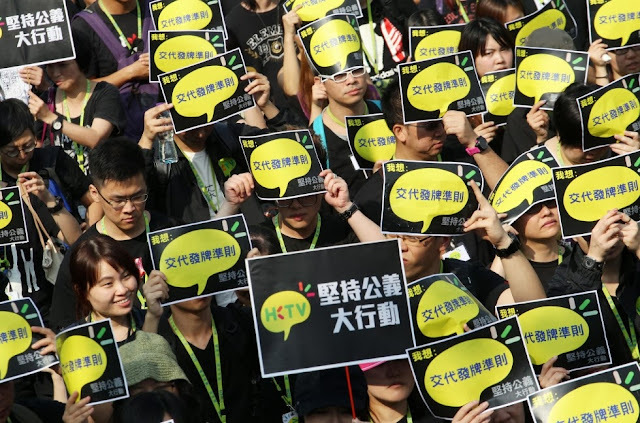 The announcement has touched off a firestorm of protest, as the public demanded to know how HKTV, which has spent years producing an impressive line-up of pilot programs, could lose out to the other two applicants. So far Leung and his posse have been tight-lipped, citing a self-imposed gag rule that applies to all cabinet discussions. Like the confused neighbors in my story, the public has been asking all the wrong questions. Neither the government’s screening criteria nor HKTV’s qualifications is of any importance to us. The only relevant question is why can’t all three applicants be granted a TV license, for there is absolutely no evidence to support the claim that, for the betterment of local broadcasting, two new entrants to the market are just right, but three is suddenly too many. The burden of proof lies with the government and not HKTV – and certainly not the public. To engage in an endless debate about HKTV’s viability compared to iCable and PCCW – the two successful applicants – is to play into C.Y. Leung’s sleight of hand. 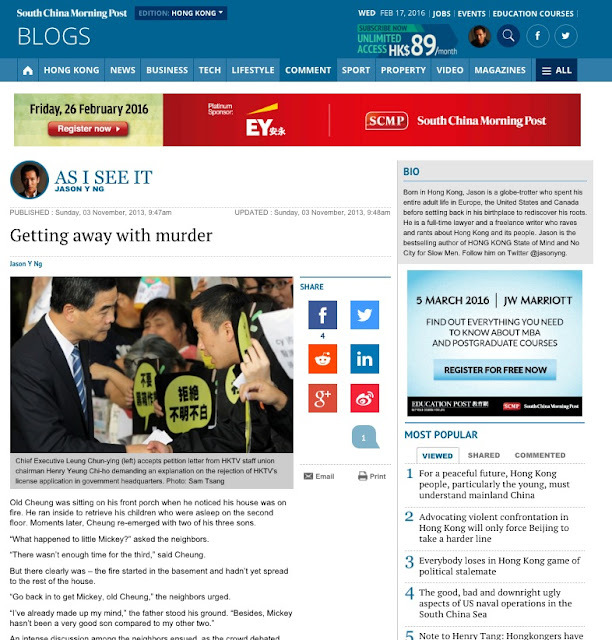 It is the same diversion tactic used by old Cheung to shift the focus away from his filicide. Until the government gives us a satisfactory answer to that key question, the only thing we can do is speculate the political motivation behind the rejection of Wong’s bid. Some say Beijing doesn’t want HKTV to drive the languishing ATV out of business. ATV and TVB are the only two current FTA license-holders and the former has been unpopular among local viewers for its Chinese ownership and pro-Beijing stance. It is said that HKTV’s entry will be the final nail in ATV’s coffin and that China doesn’t want one of its mouthpieces to go out of business. This theory seems implausible, considering that Beijing is not known to micromanage every minute executive decision in Hong Kong. In fact, Leung reportedly got a scolding from Wang Guangya (王光亞), the CCP big wig in charge of Hong Kong’s affairs, for causing another big SNAFU. If it’s not Beijing, then it must be the chief executive himself. Perhaps C.Y. Leung doesn’t care for Wong’s ego or finds his ambition a threat. Or perhaps the two have unsettled scores from past dealings. Whatever it is, it would appear that Leung’s personal vendetta has burned up what little political capital he has after the national education debacle and the abandonment of the ill-fated northeast urban development plan. The TV license saga is the latest example of Leung’s knack for overestimating how much he can get away with and underestimating how far citizens are willing to go to hold him accountable. As C.Y. Leung’s approval ratings dip, Ricky Wong’s personal stock continues to rise. Wong has become the anti-establishment hero of the month. Nicknamed “Boy Wonder” for introducing low-cost long distance phone services in Canada, the 51-year-old is a self-made billionaire and the embodiment of the city’s can-do spirit. He is the closest thing we have to Richard Branson and Elon Musk. Having poured his heart and personal fortune into the TV license bid, Wong is now seen as the David who takes on Goliaths iCable and PCCW, which happen to be owned by tycoons Peter Woo (吳光正) and Richard Li (李澤楷). 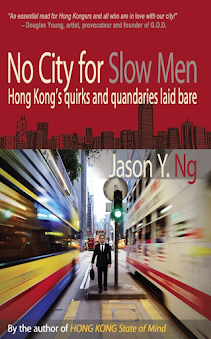 Wong’s loss is viewed by many as an affront to the city’s entrepreneurship. For if a superstar like Ricky can’t beat the property cartel, what chance does the rest of us have? In the meantime, the political saga is throwing an unwanted spotlight on TVB, the current licensee that commands a near monopoly in broadcasting. 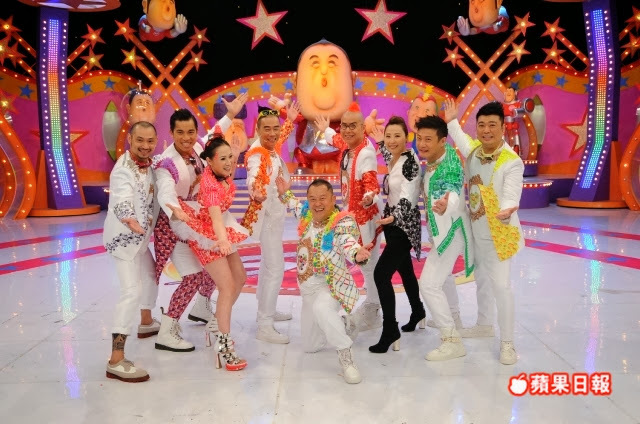 HKTV’s failed application was a wake-up call to millions of viewers who finally realized that they have been watching the same low-budget pastiche for over three decades: soap opera with stock characters and canned plots, travel and cooking programs that are glorified infomercials, and asinine game shows that insult our intelligence. And TVB doesn’t just offend viewers, it also gouges their own employees. Actors and writers are grossly underpaid and contractually prohibited from taking any outside job. That’s what happens when your employer is the only game in town – it is nothing personal. Free television means something to everyone in Hong Kong. For the elderly and the working class, it is the only form of entertainment. For the middle class who grew up in the 70s and 80s, it is a cultural glue that binds people together. For the socially conscious, it is a painful reminder of the way big business stifles our creativity. That’s why nearly 100,000 citizens regardless of age, background and political leaning took to the streets two Sundays ago in support of HKTV. But frustration and anger can only get us so far – we must ask the right questions and keep at it until the government produces meaningful answers or a third new license. 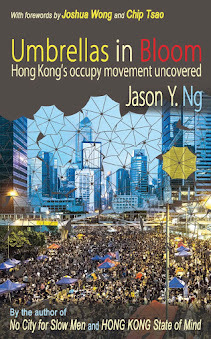 Old Cheung might have gotten away with murdering his son, but we can’t let Leung do the same with the Hong Kong Dream.